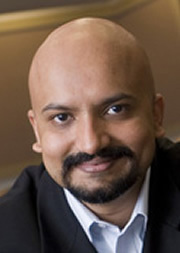 Professor Jayaraman is the Wesray Professor of Business Administration and Professor of Accounting. Professor Jayaraman's research interests are in corporate governance and the effects of accounting information in financial markets. His work on corporate governance examines how large shareholders discipline managers via the threat of exit, and the role that stock market liquidity plays in the design of executive compensation contracts. In addition to teaching a Ph.D. seminar, Professor Jayaraman also teaches Strategic Cost Analysis in the Executive, and MBA programs. Professor Jayaraman is currently interested in the informational feedback-effects of stock prices on managerial decision-making. In recent work, he has explored the functioning of financial institutions and the propagation of shocks between the banking and industrial sectors. Professor Jayaraman's publications have appeared in the Journal of Accounting & Economics, Journal of Accounting Research, Journal of Finance, Journal of Financial Economics, Review of Accounting Studies, Review of Financial Studies and The Accounting Review. His work has been presented not only at academic conferences within the U.S. and around the world, but also at regulatory bodies such as the European Central Bank and the Federal Reserve Bank of New York.